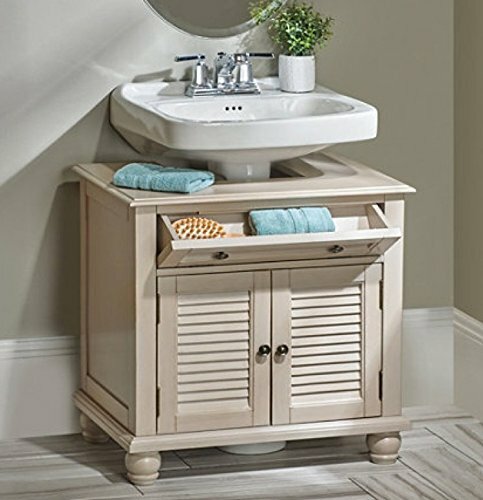 Pedestal sinks look lovely in many bathrooms, with their sleek look they take up very little room, but when it comes to actually using them for anything other than washing your hands, you quickly realize that storage is an issue! There are many creative ways to deal with the storage issue and this can be done without replacing the sink or construction in any way. These under pedestal sink storage ideas are perfect for the renter or anyone who needs that extra storage but doesn't want renovation! Check them out! This cabinet basically slides in under the sink to give you that extra storage you need. No construction, no DIY, no mess, and it looks good! You can take it with you if you are a renter. 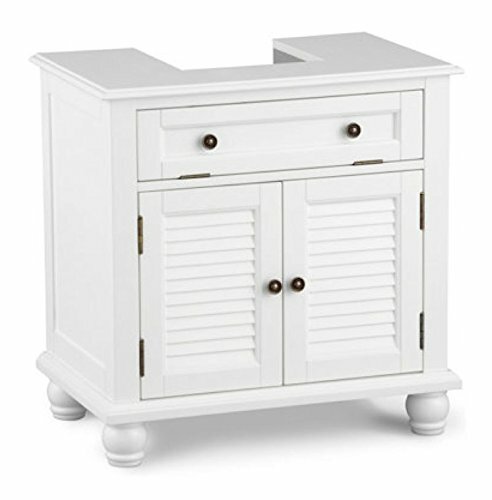 Slightly different style that the one above, this one has louvered cabinet doors,and not quite as wide. This one is perfect for those everyday things you might need to use with the flip down drawer. 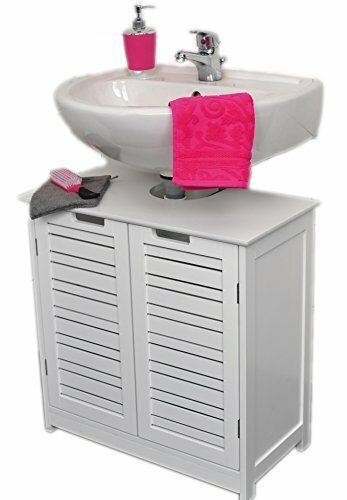 It looks good under the pedestal sink and now you have lots of room for storage such as toilet paper, towels, supplies and more. If you don't have the room for the under sink pedestal cabinets, you can attach a quick sink skirt to hide your storage, this is another affordable option to utilize that wasted space under these free standing sinks. 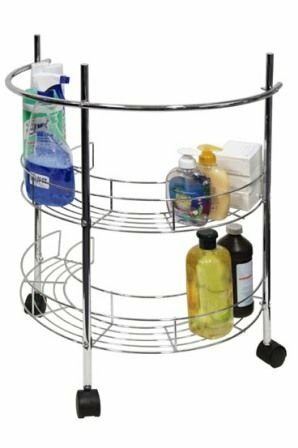 If you prefer something not as heavy looking and don't mind your supplies on show, this chrome unit on wheels simply slides in underneath. Organizing your home doesn't mean you have to always do construction or renovation, there are many innovative ways to use existing space to add extra storage. Of course the best way is to get rid of things you don't need. The bathroom can easily overfill with half used products so start with having a good clean out, get rid of things you don't need and donate others. Then really take a good look at the space you have left. A tiny bathroom still has lots of storage if you just utilize the right spaces, such as the back of the door, the walls, even the shower curtain can have storage. You will be amazed at just what you can do with a simple bathroom that has a toilet and a pedestal sink. 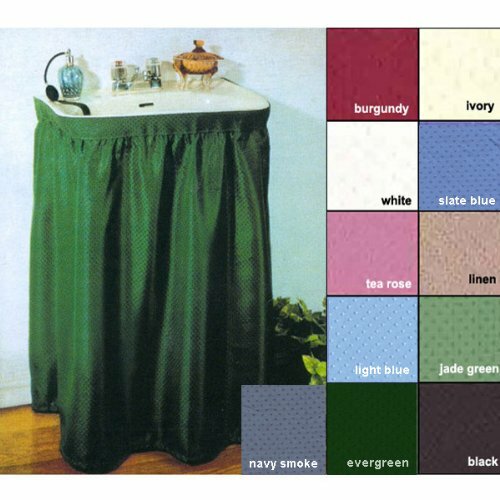 We had one of these in our last house and I used to have to keep toilet paper and cleaning supplies for it in the kitchen which was a pain, so having these things right in the bathroom not only put them in their right place but freed up room in my kitchen! Shopping Online Can Give you Lots of Organizing and Storage Ideas! Click on any of the pictures or links above and you can get all kinds of ideas for addressing the pedestal sink storage issue and more.